The second DELOS Conference, which was held on 5-7 December 2007 in Tirrenia, Pisa, Italy, not only provided a forum to present and discuss recent research advances in the field of Digital Libraries, but also provided the opportunity to summarise some of the main achievements of DELOS during the past four years. After four years of activity, the DELOS Network of Excellence on Digital Libraries, supported by the European Union under the Sixth Framework Programme and managed by ERCIM, has reached the end of its funded lifetime. However, the activities of DELOS actually started many years ago, first with the DELOS Working Group at the end of the nineties, and then through the DELOS Thematic Network, under the Fifth Framework Programme, from 2001 to 2003. Over these years, the objective of DELOS has been to fill the gap between current Digital Library practice and the needs of modern information provision. The goal has been to foster the development of technology that will eventually overcome the current restrictions of today's information systems. fostering collaborative research in the direction of this vision. The DELOS community has provided significant contributions to many key components of digital libraries. This is evidenced by the vast volume of scientific papers (more than 500) produced by the DELOS community in the last four years and by the number of projects and applications in which members of DELOS have provided or are providing a contribution. As important examples, we can cite the Digital Library Reference Model and the DELOS Digital Library Management System, which were both presented at the Conference. The conference was attended by more than 80 participants. The 33 presentations reflected the main fields of interest of the DELOS community (DL Architectures, Interoperability, Information Access, Image and 3D Objects Retrieval, User Interfaces, Personalization, Preservation, Evaluation). 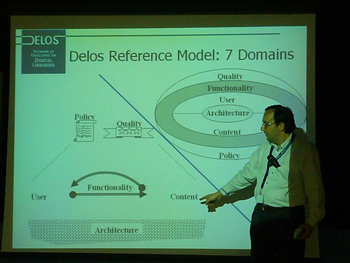 One session was dedicated to the DELOS Reference Model, which constitutes one of the major legacies of DELOS to the digital library community. The final morning session consisted of presentations and demonstrations of the DelosDLMS, a globally integrated prototype of a Digital Library Management System, offering DL services and specialized functionality provided by members of the DELOS community. The DelosDLMS currently offers text and audio/visual searching, relevance feedback tools, novel interfaces and information visualization, annotation of retrieved information, and support for sensor data streams. Yannis Ioannidis presenting the DELOS achievements. There were also three invited talks from key players in the field: Fabrizio Gagliardi, Microsoft, who described "Technical Computing at Microsoft Research", Maurizio Lenzerini, University of Roma La Sapienza, on "Ontology-based information access", and Stefan Gradmann, University of Hamburg, talking about "Interoperable Information Space  moving towards the European Digital Library". The results achieved by DELOS over the years were summarised in a concluding session both by Yannis Ioannidis in a presentation entitled "DELOS Achievements" and also by a number of participants who presented various activities that have seen the light as a result of work which begun in or was sponsored by DELOS. These activities include a number of independent EC funded projects, eg MultiMatch, TrebleCLEF, LOGOS, DILIGENT, DPE, etc. as well as national initiatives such as Rinet in Greece, and the series of IRCDL conferences in Italy. The conference proceedings and copies of all presentations can be found on the DELOS Web site. Although, sadly, this was the last official event of the DELOS Network of Excellence, DELOS will live on in through the newly formed "DELOS Association" and it is hoped that many of the DELOS events, such as the summer schools and the scientific workshops, will continue in the future. For more information about the DELOS Association. Launch of the DELOS Association for Digital Libraries - In order to keep the DELOS spirit alive after the end of the DELOS Network of Excellence sponsored by the Sixth Framework Programme, a non-profit association has been established. The main objective of this initiative will be to continue the work of DELOS by promoting research activities in the field of digital libraries through the organisation of workshops, working groups, schools, etc. Membership is open both to individuals and to organisations, and the membership fee for the first year has been set at 50 for individuals and 2000 for organisations. Complete information, including the Statute of the Association and a membership application form can be found on the DELOS Web site at http://www.delos.info/Association/.